The snowshoe to Chasm Lake should be on every list for anyone in RMNP. Chasm Lake trail takes you to a high alpine lake that sits below the towering ‘Diamond’ on the famed Longs Peak. From Estes Park, head south on Highway 7 for about 14.5km. Turn right (west) on Longs Peak Rd for 1.6km and follow the signs to the trailhead. Please note, this is an advanced snowshoe. In order to complete this route, you should have significant avalanche training, knowledge of self-arrest technique and possess a mountaineering axe for safety purposes. If you’re in doubt, please hire a certified mountain guide. 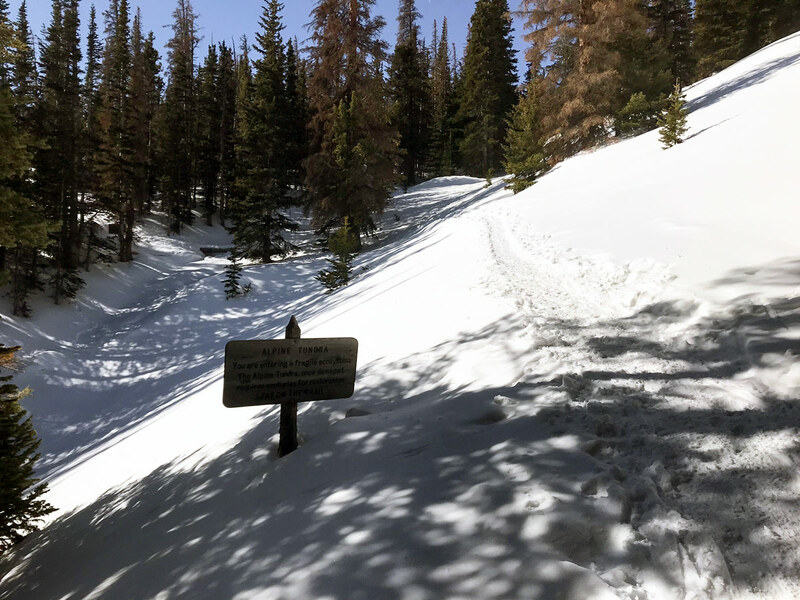 Depending on snow levels, you may be able to do this trip without snowshoes, however it can be icy and microspikes are recommended. The snowshoe to Chasm Lake is a challenging trip, both technically advanced and physically difficult. Do not let the mileage deceive you as this snowshoe starts at 2743m in elevation and is far harder than it looks. 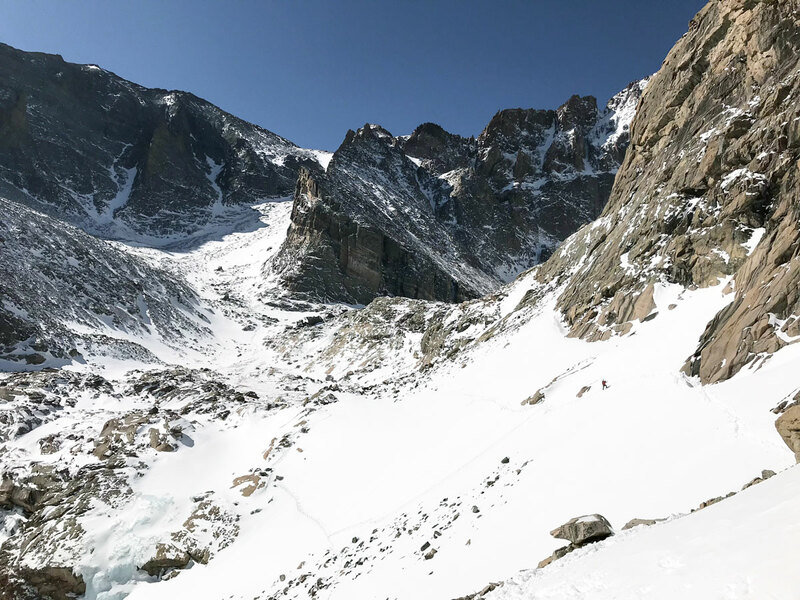 The challenge, however, is worth it as you get beautiful views of Longs’ Peak Diamond Face as it towers over Chasm Lake with a view of Columbine Falls frozen above Peacock Pool. 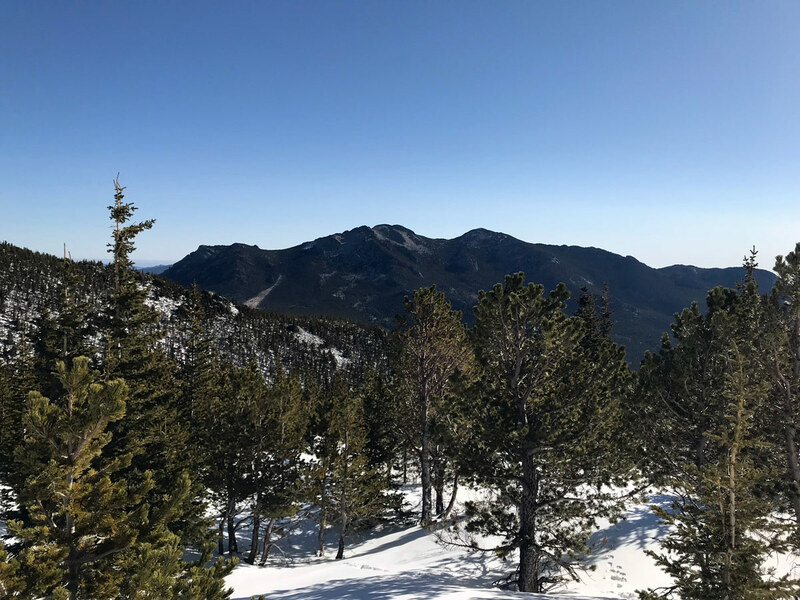 This is one of the trails that particularly requires winter traction and the knowledge on self-arresting with a trekking pole or mountaineering axe as there will undoubtedly be ice and snowfield en route. 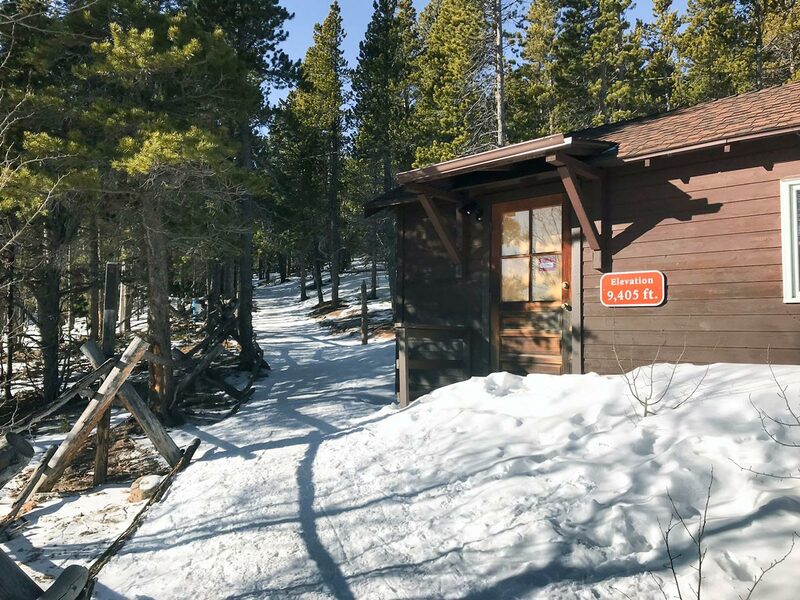 Please note, the ranger station will also be closed for winter. From the trailhead, find the Longs Peak info board and trailhead and glance at the day’s weather report. 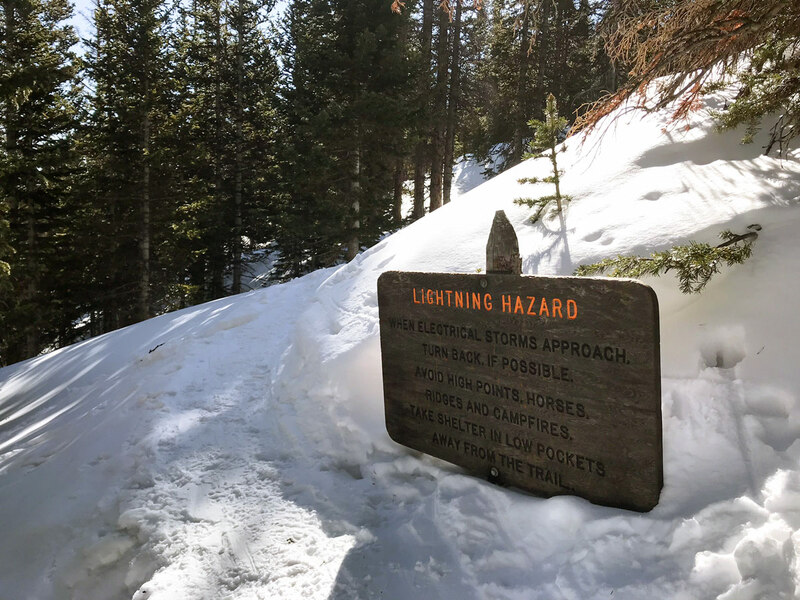 Weather can change fast while hiking in RMNP so make sure you are prepared. Start by following the trail west from the Ranger Station. This is also where you would start for the hiker’s summit of Longs Peak in summer. 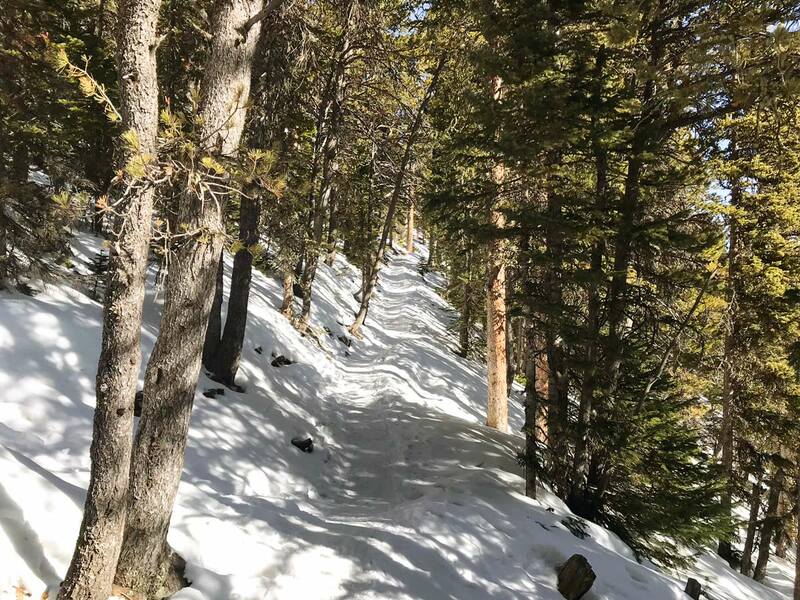 The trail starts off at a moderate gradient but gets steeper and steeper as you snowshoe deeper into RMNP. 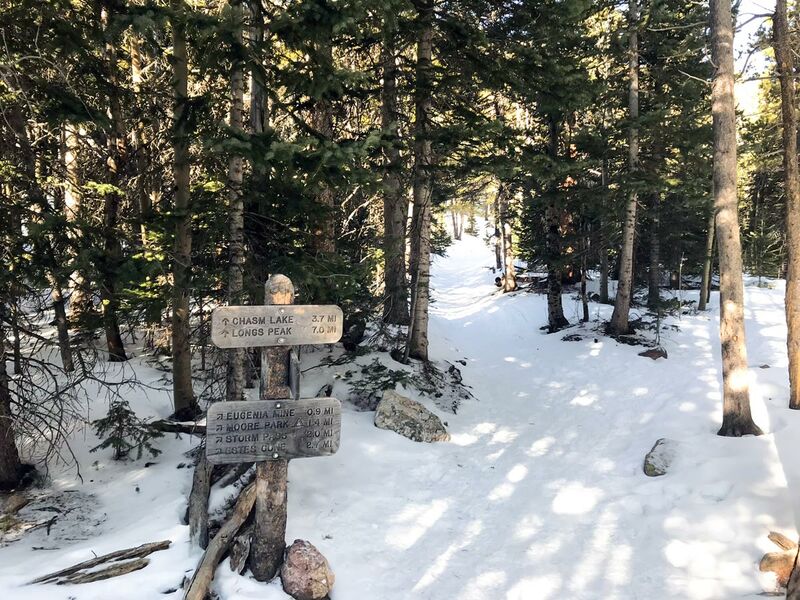 A 0.8km into the snowshoe, stay left on the main trail and follow the signs to Longs Peak at the intersection. You will remain in the woods for over 3.2km, catching short quick glimpses of Longs peak through the trees. At 2.7km, you will get to the first footbridge. Most of the year, this creek crossing is dry, however, after rain or during snowmelt you can see the stream below. At 3.2km, you will get to a longer bridge located over a year-round river and small water cascade. Shortly after, pop out of the woods into the alpine tundra. The trees become shorter and the trail gets rockier and steeper. You will see Battle Mountain to your right along with a trail leading to the Battle Mountain campground. Instead, stay on the main trail and continue to follow signs for Chasm Lake and Longs Peak. At a large junction, approximately 5.5km into the snowshoe, you can rest for a bit before continuing on. 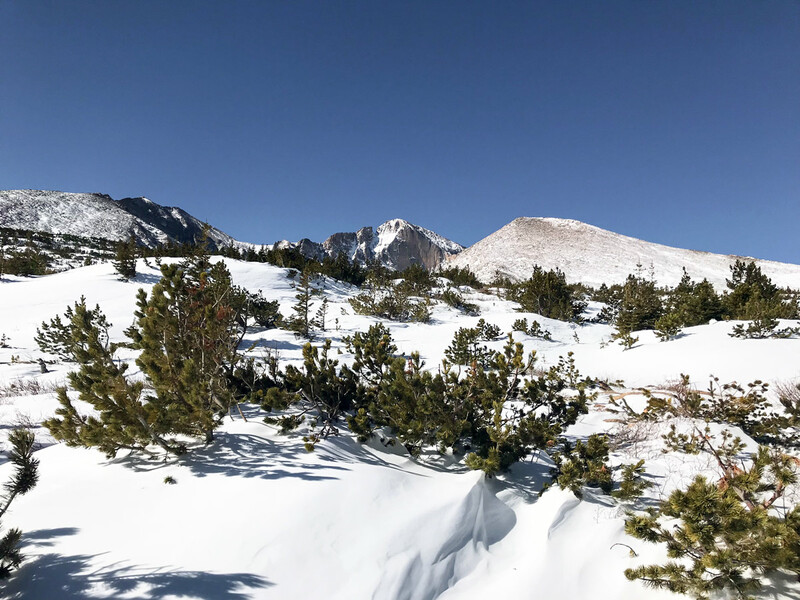 To your left, you will find a bathroom, and on your right is a trail that would take you to the hiker’s summit of Longs Peak through the boulder field and Keyhole route. Instead, continue straight for 1.2km to Chasm Lake. 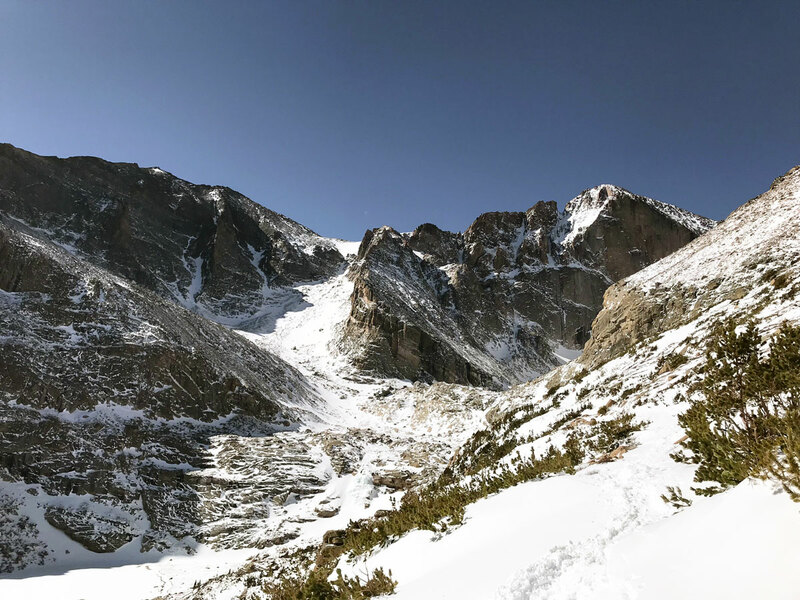 The trail now descends for 0.8km as it leads you to the views of Longs’ Peak Diamond Face straight ahead. On your left you can see Mt. Meeker, on your right is Mt. Lady Washington. You will have to cross snowfields along the trail. Watch your footing and use a stick, walking pole, or your hands for better balance on the snow. The trail leads you back up in elevation to the top of Columbine Falls. Follow the path as you make your way over the large boulders that are placed over the river that flows into the waterfall. Keep to the trail in this section as the ground around is very sensitive. The trail winds through the marsh, back and forth over the river until you reach the rocks. Look to your right: there is another waterfall coming down the rocky cliff. You will see a sign pointing up the rock to Chasm Lake. Find the path of least resistance for a short but easy scramble up the rocks. You will climb about 15m. There are a few cairns to mark the way, but you can choose whichever way is easiest for you to get up the rocks. At the top, Chasm Lake will come into view and the Diamond face of Longs’ Peak looms over you! To return, retrace the route you came back to the trailhead. This route can be very exposed, slippery and prone to avalanche. Proper training is required to safely compete this route.